The best part about the Grammy Awards is being able to check out the photo galleries to see what was worn on the red carpet. I don’t normally watch award shows, and yesterday was no different. However, I do look for photo galleries to see what the celebrities decided to step out in. With that said, I’ve come up with my list of the 10 Best Dressed at the 2013 Grammy Awards (in no particular order). Say what you will about Rihanna (and I will too), but she looked stunning. Everything looked wonderful, from her makeup to the dress. She can get away with any hairstyle and color, and almost any outfit. 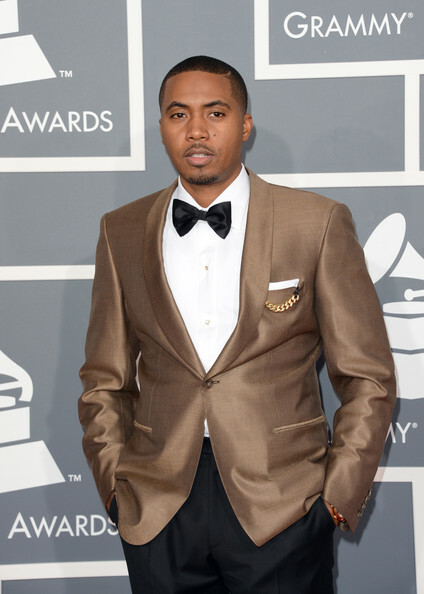 Nas looked quite dapper in his gold, black and white. As far as I’m concerned, he was the best dressed male. At least from what I’ve seen in the photo galleries. I really loved the jacket, and pairing it with the black pants suit him very well. I really liked Kelly’s dress because of the cutouts, and the simplicity of the dress. It was well-fitting, and she wore it wonderfully. However, I will say that I hate that hair color. Swift always dresses to impress for awards shows. So, the Grammys were no different. I really liked the cutouts, and the flow of the dress. It was very elegant. Well, Kelly is on a roll. She was definitely talked about a lot after her Super Bowl appearance, and now there is more to talk about. Normally, I could careless for dresses that expose a lot, but her dress exposed in the right places. Although it was risky, she looked gorgeous. 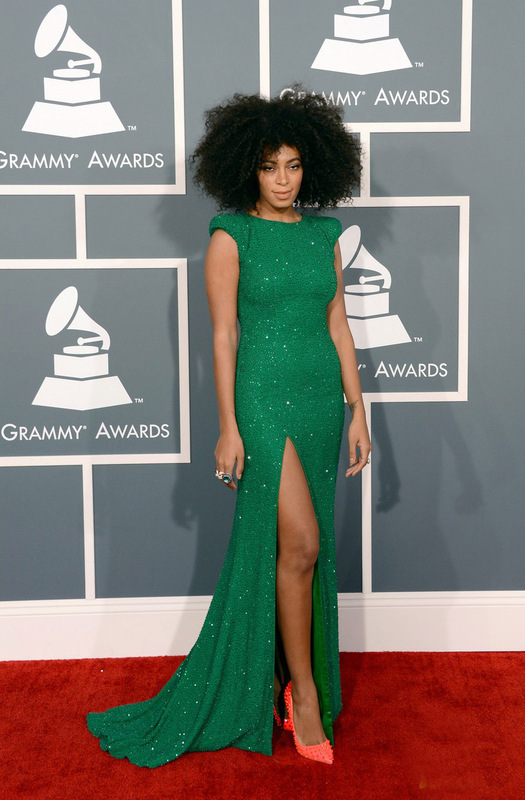 I absolutely loved Solange’s hair, and the dress was beautiful! I didn’t really care for the studded heels. Although, I liked the orange and emerald-green paired together, it just seemed a bit overboard with the studs. I really liked Estelle’s self-designed two-piece. It was funky, and unique. I really liked the colors she chose, as well as the shape of the skirt. I think she stepped out the box, and took a risk. She didn’t disappoint. I really liked JT’s choice of attire, especially the black and white shoes and handkerchief. Everything flowed quite nicely. While a lot of men wear black to the Grammy’s, his combination stood out to me. I don’t really care for Jay Z, but I can’t deny that his ensemble was very nice. I especially liked how his jacket was cut, and how the lapels were the main focus. Good look, Jay Z. 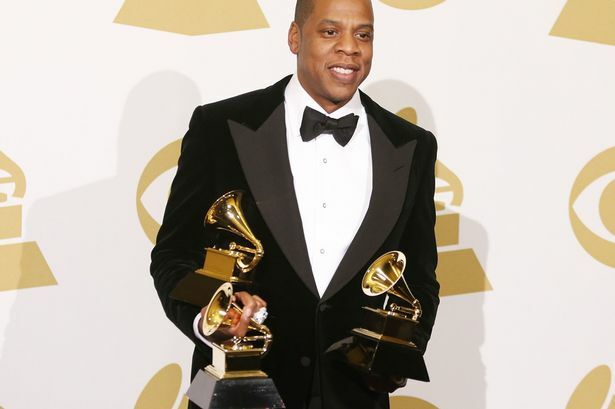 How does your Best Dressed at the 2013 Grammy Awards list compare? Please share your thoughts! Posted on Mon.Feb.11.2013, in Fashion and tagged 10 Best Dressed, 10 best dressed at the grammys, 2013 Grammy Awards Show, 2013 Grammys, a mess, Adele, awards show, Best Dressed, Beyonce, bowl appearance, Carrie Underwood, celebrities, celebrity gossip, Chris Brown, clothing, dapper, Destiny's Child, Dream, emerald green, entertainment, Estelle, fashion, gossip, Grammy, Grammy Awards, J Lo, J Lo's leg, jacket, Jay Z, JT, Justin Timberlake, Kelly Osborne, Kelly Rowland, Nas, outfits, photo galleries, photos, Red carpet, Rihanna, Riri, singers, Solange, style, suit, Taylor Swift, the red carpet, the stars, tuxedo, What the stars wore at the Grammys, Who wore what?, Worst Dressed, Worst Dressed at the Grammys. Bookmark the permalink. 4 Comments. i totally agree with 8 of your 10 picks. kelly rowland’s dress could have been stunning but it went too far – tmi! estelle’s outfit wasn’t so bad, but was a lil’ too busy to make my top list. Kelly’s dress was definitely very risky, and could be seen as a flop rather than a success. Estelle’s dress did have a lot going. It wasn’t your “typical” busy Grammy dress, which is why I liked it. However, I can definitely see why they didn’t make your top list. What other celebrities did you pick? Yes I loved Rihanna’s dress & that red lip! I hated that Chris Brown was with her! 😦 I would have put Kelly Rowland & Taylor swift before Kelly Osborne but that’s just cuz Kelly Osborne dress was basic! U shud do top 10 worst dress—the dream should be #1. What did u think about frank ocean performance – forest gump? And was it just me or did Beyonce seem a little uncomfortable on stage last night? I don’t like seeing her with him either, but she does look happy. I did like they’re dresses better than Kelly Osborne’s. The list wasn’t in order, but I do agree with you. Yes! The Dream would be numero uno on that list! lol! I just watched the clip of Frank Ocean’s performance. Where do I start? I think he is talented, but I think he should have chosen a different song. “Think About You” is such a strong song. So, I think he should have performed that song. Beyonce did look uncomfortable. She probably shouldn’t have been paired with Ellen. Someone who can do better with ad-lib should’ve co-presented with Ellen.